Norbert Sommer (Vice President Development Door Systems Brose Group, 2nd from right) and Michael Thienel (Project Manager Innovation Team Advanced Development Door Systems, right), received the Best-Of award in the Materials category for the Brose lightweight door system made from endless-fiber-reinforced thermoplastics during the international Materialica trade fair in Munich from Christian Trassl (Board Member and Deputy Head of Department for Plastics at Neue Materialien Bayreuth, left) and Robert Metzger (Managing Director MunichExpo Veranstaltungs GmbH, 2nd from left). Automotive supplier Brose has won the Materialica Design and Technology Award 2014 for a lightweight door system made from endless-fiber-reinforced thermoplastics. 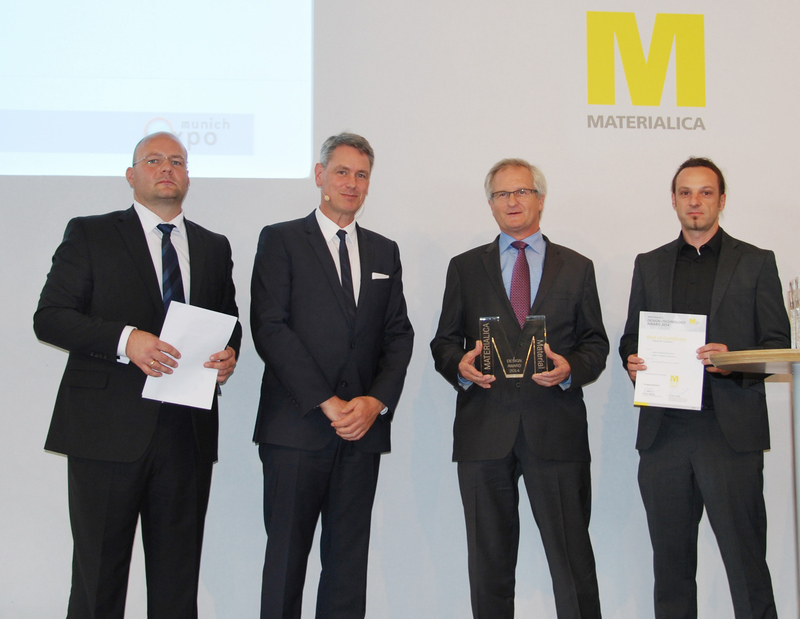 The award ceremony took place on October 21 at the international Materialica trade fair for materials applications, surface technology and product engineering in Munich. Brose’s product impressed the judges and earned the company the acclaimed Best-Of design award in the materials category. “Unlike other awards, the Materialica Design and Technology Award places equal emphasis on design, technology choice and material innovations and brings together customized material developments and convincing industry innovations. Our desire is to award prizes for feasible designs of the future and to set new cross-industry trends,” Robert Metzger, Managing Director of MunichExpo Veranstaltungs GmbH and organizer of the Materialica Design and Technology Awards, explained at the award ceremony. A total of 16 companies received gold and silver awards in the categories Materials, Surface & Technology, Product and CO2 Efficiency. Four received the Best-Of award. Since it was founded in 2002, the Materialica award has become one of the most important awards on the international design scene. “We see the Best-Of award as confirmation of our development efforts,” said Norbert Sommer, Vice President Development Door Systems Brose Group. “With an intelligent mix of materials we have succeeded in developing an innovative door system that sets new standards in terms of lightweight design, functionality and design freedom. We can make weight savings of up to 40 percent compared with a conventional door system – while ensuring good crash safety performance and high function integration,” Sommer explained. Brose’s new generation of plastic carriers is expected to go into series production in 2016. “Because of global targets for the reduction of CO2 emissions and the trend towards higher efficiency, lightweight design is very important in the automotive industry. Each year Brose invests 8 percent of its turnover in the development of innovative products, methods and processes,” says Kurt Sauernheimer, Executive Vice President Door Systems Brose Group. The company has established the modular door as standard: functions like window regulators, latches, wiring harnesses, crash sensors and control electronics are fitted to a carrier plate and the entire system is delivered, pretested and ready-to-fit, to the car manufacturer’s assembly line. As a systems supplier, the mechatronics specialist has the capability to develop and manufacture all the key components.